Are you a Very Important Bouncer? Grab a Gravity VIB Annual Pass & bounce at Gravity Bluewater every day for only £12.50 per person per month . . . cheaper than a single visit and outstanding value!! - Available from 18 months to Adult - School and Bank Holidays included - Valid for all open jump sessions - Valid for SEN Disability Sessions - Valid for all Parent and Toddler Sessions* * when accompanied by a paying adult OR adult VIB Annual Pass holder VIB Annual Passes allow you to enjoy one hourly session per day at your Gravity Park for an amazing monthly fee. 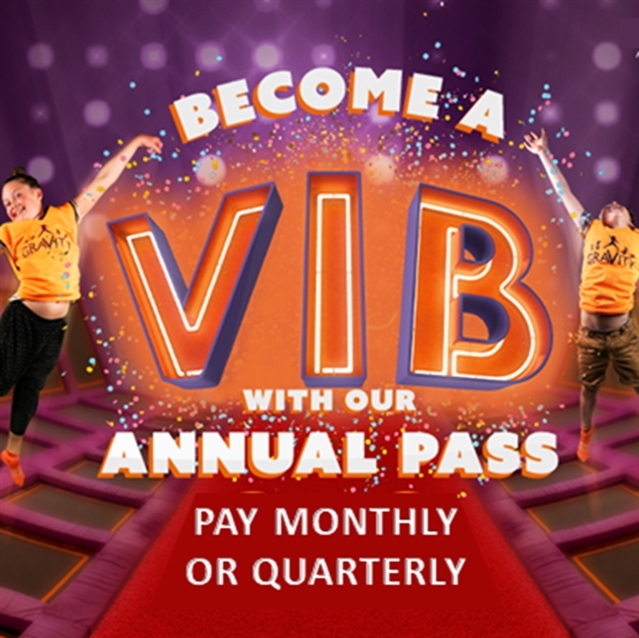 VIB Annual Passes are for walk in use only, booking online is not available. The pass is not valid for whole park sessions such as Fitness Classes, After Dark, Gravity Glows or private events. The pass will be valid for one-hour open jump only on Unlimited Tuesdays and is not valid for Climb Sessions, Golf Sessions, Aerial Adventures or Virtual Reality, where these activities are available at a Gravity location. Buy this voucher and bring with you on your next visit to have your VIB Annual Pass added to your account – your photo will be taken and held on Gravity’s system for identification. Monthly payments are taken via continuous debit or credit card payment with a minimum term of 3 months, after which payments are taken on a rolling monthly basis with 28 days notice in writing required to terminate the agreement.